Will Donald Trump Confront the CIA? Will He Take the Risk of Becoming “Another John Kennedy”? 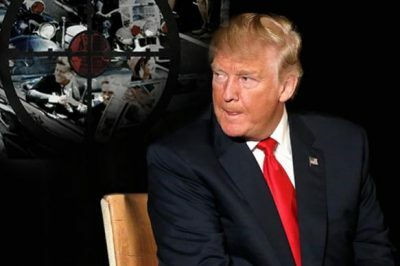 On Saturday, October 21, US President Donald Trump wrote on Twitter that he was ready to declassify 3,000 CIA and FBI files related to the assassination of US President John F. Kennedy. The same morning, Politico wrote that the head of the White House refused to declassify the documents for reasons of national security. Donald Trump has an excellent opportunity to take revenge for all the humiliations and insults that the CIA and the FBI have made him go through since his inauguration in January 2017. US special services declared a real war on the head of the White House as they were destroying his reputation by leaking confidential reports about secret connections of the Trump team with Russia. Now Trump said he would not interfere with the US-stipulated procedure to declassify 3,000 files of the CIA and the FBI about the secret of the assassination of the 35th US President John F. Kennedy, which took place on November 22, 1963 in Dallas, Texas, at 12: 30 local time. It is expected that The National Archives will disclose secret files of the CIA and the FBI about the 1963 tragedy on October 26. In addition, more than 30,000 documents that could be published only in parts will be declassified as well. Should the publication of those materials reveal that US special services were involved in the Kennedy assassination, their reputation will be irreparably damaged. However, many analysts believe that both the CIA and the FBI have long eliminated most dangerous evidence that could indicate their involvement in the assassination of John F. Kennedy. Therefore, declassifying another portion of previously classified documents is not going to add much to the already known facts about the tragedy in Dallas. An independent commission was convened in 1992 to study the “assassination of the century.” The move froze the publication of secret documents for a quarter of a century, that is, until October 26, 2017. Now is the time when the publication of those files has come. On November 22, 1963 US President John F. Kennedy was killed while his car was traveling through the streets of Dallas. The governmental Warren Commission came to conclusion that the crime was committed by Lee Harvey Oswald, who was acting as a lone killer. However, US intelligence services were acting suspiciously from the very start of the investigation. They refused to analyse the trajectory of the bullet that killed Kennedy. The amateur film of the Kennedy assassination shows Kennedy’s body being thrown backwards at the moment of the shot. At the same time, the book depository, from where, according to the official version, 24-year-old Lee Harvey Oswald was shooting, was behind the motorcade. According to most primitive logic, the bullet fired from there was supposed to push Kennedy’s body forward, but not vice versa. In addition, the commission claimed that the killer used a manually operated rifle, i.e. he had to pull back the bolt and release it. Oswald managed to make three shots in five seconds. Later, finest snipers of the United States could not repeat the trick, although Oswald himself was not a first-class shooter. The bullet that got into Kennedy’s head, for some reason, is missing in the materials of the case. The victim’s brain that had been taken for examination, mysteriously disappeared as well. More than 50 people, who eye-witnessed the mysterious assassination, died mysteriously afterwards. The surgeon, who performed the autopsy of Kennedy’s body, was found dead in his apartment. The taxi driver, who gave Oswald a lift, died in a car accident. One of the eyewitnesses of the assassination who testified about two men shooting from behind the fence lost his life as well. The most suspicious aspect in the whole story is: why did the police let Jack Ruby shoot to kill Oswald at point-blank range two days afterwards when he was being transported from a police department to a Dallas prison? Many assumed that Oswald could uncover the names of his curators from the CIA and the FBI, that is why special services decided to do away with Kennedy’s assassin through Ruby’s hands. Three years after Oswald’s death, Jack Ruby died under mysterious circumstances too. Another suspicious fact: all amateur photos and video materials depicting the moment of Kennedy’s assassination had been confiscated and immediately classified. The main amateur video, which was made as the motorcade was traveling on the street, was edited in a way to exclude the version about the existence of another shooter, who was aiming at the president from behind the fence. Oswald visited the FBI office only two weeks before Kennedy was assassinated. According to independent experts, Oswald was supposed to distract attention, whereas the bullet that shot Kennedy in the head was fired by a professional sniper from behind the fence. There is circumstantial evidence saying that then FBI Director Edgar Hoover knew about the forthcoming killing of Kennedy and wanted Kennedy dead, as president’s brother Robert, the US Attorney General, declared a crusade against mafia and special services. Thus, 54 years after Kennedy’s assassination, US intelligence agencies are still in no hurry to publicise facts and documents related to the investigation of the assassination of the 35th US president. Will Donald Trump be able to change the situation and tell the whole truth about the conspiracy? After all, if Trump openly goes against the CIA and the FBI, he may jeopardise his own life too. Most likely, one of the greatest mysteries of the 20th century will remain a dark mystery.